How do I upload raw data? 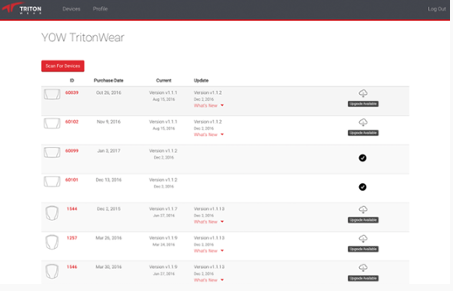 You can upload raw data through TritonWear Update. Before you begin the upload, make sure your internet connection is stable and that the devices are completely dry. Log on to TritonWear Update (desktop app) using the same credentials as TritonWear Insights and TritonWear Live, and plug in the device used during practice. 3. Fill in the information and click Upload. 4. Click Yes on the pop up asking if you are sure you want to upload data. The lights on the device will turn purple, and the app will begin to read and upload the data. This process should take no longer than 5 minutes. If it takes longer, stop the process, restart the app, and start again. 5. Once the data upload is complete, the screen will return to display the upload raw data option. You can now safely disconnect your device.